September 7th in WordPress Themes by Wordpress Jedi . There are lots of people who attend fitness classes on a regular basis to stay fit and keep their weight under control. 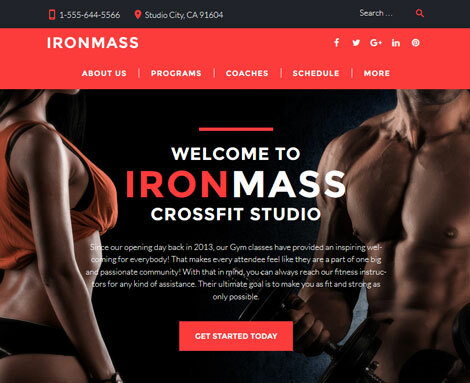 If you own a fitness business, you need to build a professional website to promote it properly. IronMass is one of many fitness themes you can use for that project. It is built with a drag & drop page builder with more than 25 modules for you to choose from. IronMass offers multiple layout options. It has an appointment manager feature, so your customers can book their place on your site. Webmasters also have the option to create online schedules for single or multiple classes. IronMass has modules for pricing tables, sliders, buttons, and timers. This theme is fully responsive and lets you customize its options with Live Customizmer. It is coded in HTML5 and CSS3. *some of our articles and lists might include aff links to fund our operations. Please read our disclaimer on how we fund Exxponent.